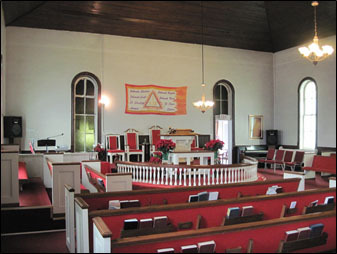 Bethel African Methodist Episcopal Church was formed by African Americans in Acworth, Georgia in 1864, after Union General W. T. Sherman and his troops passed through town. The church congregation consisted of enslaved and newly-freed persons, and within seven years, they purchased a one-acre lot just north of downtown. By 1882, the sanctuary was built, and in 1895, two towers and a vestibule were added, creating the imposing “Church on the Hill” that still graces the northern approach to historic Acworth. For over 130 years, Bethel A.M.E. Church has served not only as a house of worship, but also as the social center and principal gathering place of the community. 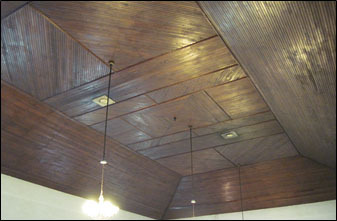 The church was designated a City of Acworth Historic Landmark in 1998, and was listed in the National Register of Historic Places on May 9, 2002. 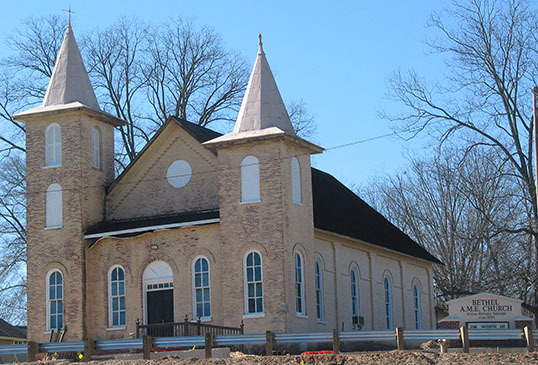 The Romanesque Revival style church is a rare example of a 19th century African American church that remains virtually intact and still home to a vibrant A.M.E. congregation. In 2012, the church authorized the documentation of the property in a conditions assessment report undertaken by Laura Drummond of APPS. The report was the preliminary to a capital campaign to raise funds for the rehabilitation of the church.